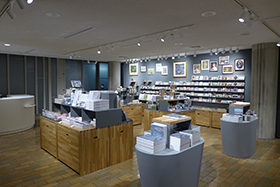 Various stationary and sundry goods featuring images from NMWA works, such as Monet's Water Lilies, catalogues of the NMWA collection, and exhibition catalogues can be purchased in the Museum Shop. The Book Corner features some 2,000 titles on art subjects, suitable for readers from elementary school to specialist art research levels. There are some books which can only be acquired in this shop. We hope visitors will stop by during their museum visit. Suica electronic money services and credit cards are accepted for purchases at the shop (UC, MasterCard, Visa, Saison, JCB, American Express, and Diners Club are accepted). The Museum Shop is accessible to all. An exhibition ticket to the museum is not required. Please visit us.